Mälardalen Luna Construction University works with the multi-artist Mikael Genberg to create a robot to send to the moon to build a house. The house on the Moon is a project to bring home a reading on the moon as a symbol of what man can achieve. Genberg robot deployment of the cabin space rocket, to find a vacant building stable and the construction of the first planet. "We want to train students to think creatively, to work together, using the latest technologies, and to dare to above. The most important thing is not always reach the goal. If you aim for the stars in at least reaching to the tops of trees, or even the moon, "says Lars Asplund. By working together, students go from concept through construction and planning to finally have a real robot. "We are here for Mälardalen University," says Professor Lars Asplund, the main inventor of the robot and a good model in the program. 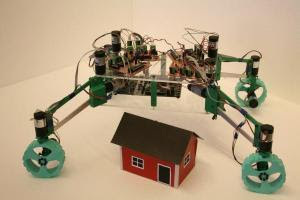 The aim is that the robot - which has the working name of Roony - to set the hut on the moon in 2012. Mikael Genberg is an artist of Västerås, which is best known for their alternative livelihood. Today Carpenter Hotel is 13 meters high above the trees in the park in Västerås Vasa. In Lake Mälaren, one kilometer from the port, there is a building with a living room under the name Otter Inn Hotel. The little house on the moon is barn red with white cut-off - after all, the first on the moon, this period will be Swedish.